This painting was previously attributed by the Public Catalogue Foundation to John Elliott (1858-1925) but the signature in the bottom right very clearly reads ‘H Elliot’. There is no trace of an 'H Elliot' in the Grove Art Online catalogue or in Christopher Wood’s The Dictionary of Victorian Painters. Census records from 1841 to 1911 do not indicate anyone of this name who might be considered a likely fit. The artist may well have been an amateur. 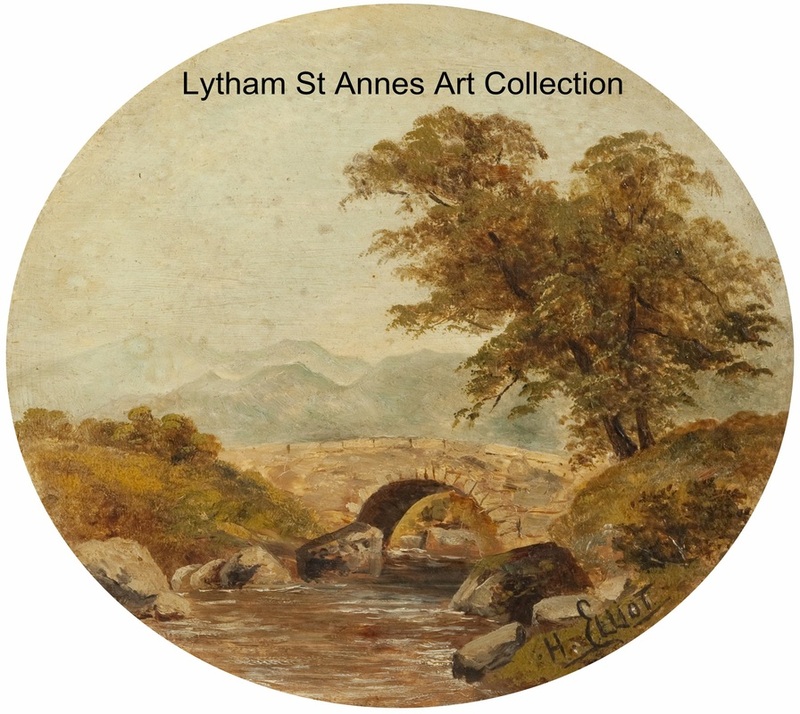 The eye is drawn to the bottom third of this circular painting where the rounded arch of the bridge is mirrored by the curves of the sloping river banks either side. Irregular-shaped boulders frame the mouth of the arch. The brushstrokes in white on the surface of the water suggest movement and a degree of turbulence as the water flows under the bridge. Beyond, undulating hills loom indistinctly against a pale sky. A large tree leans across from the right of the bridge, dominating the upper part of the scene. Shore Scene with Boats, Cornwall and Rocky Coast at Sunset, Devon. ​He died in 1960 and was buried in Lytham Park Cemetery.